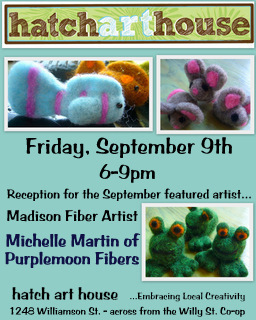 The featured Hatch Art House artist for September is fiber artist and felter Michelle Martin of Purplemoon Fibers. She creates a variety of hand made wool felt creations. Michelle believes fiber art should be a feast for the eyes and the hands, full of color and texture. Stop by Hatch from 6-9pm to celebrate Michelle’s work! Refreshments will be served. There is a parking lot behind Hatch off of Baldwin St.